I haven’t always been the paragon of taste and sophistication that I am today. As a child, I detested any sort of foodstuff that couldn’t be purchased on a stick at a baseball game, and all of my parents’ attempts to broaden my horizons were met with indifferent shrugs followed by demands for pudding. Even after I began to allow my palate to develop (by which I mean “I stopped picking the onions out of everything”) I still resisted any attempt to convert me to one cuisine in particular: Chinese food. All the slimy, greasy noodles and mystery meats mixed with alien veggies and wrapped in bland pastry wraps caused me to reflexively hurl my plate out the window like it had spontaneously caught on fire. Ah, how backward the me of 2013 was. During that summer, my father brought his truck around to help me pack up and move stuff from a rat-hole apartment to a much nicer though significantly cozier one. As we talked in front of the building, I noticed that he had a carton of leftover restaurant food sitting on the front seat. “Wht’s that from?” I asked. “Ugh, no thank you,” I sneered. Actually, I quite like shrimp, other than the fact that shrimp can be kind of a bully that forcibly enrolls me in the “Twenty-Yard Toilet Dash” event from time to time. Anyway, since the alternative was proving to my dad I actually am every bit the disappointment he pretends I’m not, I decided to slip a slip a big salty spork-full into my mouth, and the moment I did it was like a choir of angels suddenly appeared and tangoed on my tongue. The flavor was incredible – all those spices commingling made me want to hug the world with my lips. Suddenly, I realized that just because I ddin’t like a particular ingredient on its own didn’t mean I couldn’t find a place for it in some other dish. 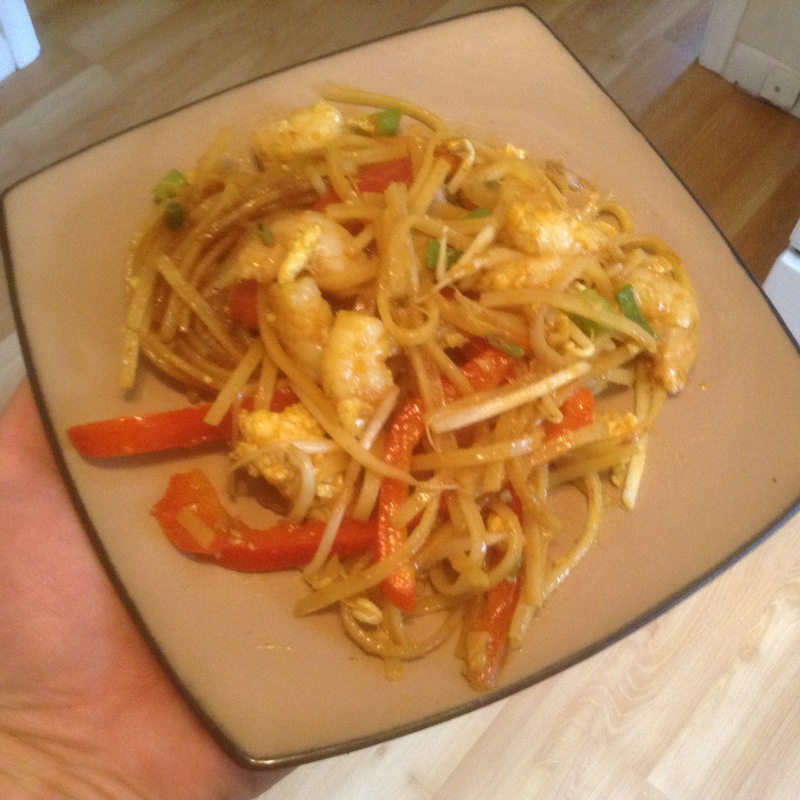 So, yeah, the Singapore noodle – the recipe so undeniably delicious that I finally gave Chinese food a shot. I’ve even tried to recreate the experience, using a recipe that my parents found on America’s Test Kitchen, but it’s not quite the same. Also, making the noodles at home dirtied every dish and level surface in my entire house, which is why the hpoto above is me holding the plate in wone hand while I’m balancing the iPad against my upper arm in the other. Now that I’ve finally conquered my prejudice against Chinese food, there’s just one major culinary obstacle standing between me and true enlightenment. Who wants to treat me to sushi?